Get ready to laugh with Gallery in October as we take you to hear Oklahoma comedians around the state, and introduce you to the characters of OKC Improv. OKC Improv brings the art of improvisation to life. “Improvisation, or improv, is a form of live theatre in which the plot, characters and dialogue of a game, scene or story are made up in the moment”- OKC Improv webpage. OKC Improv is working to develop the improv community in Oklahoma and is gaining recognition for their talent and dedication to the community. They entertain and teach in a variety of ways: hosting performances, and teaching workshop classes for adults, teens, and children. Managing director Sue Ellen Reiman said that improv is a way to let loose and forget about the rules; it’s a way for adults to play and channel their inner child. The Gallery staff is getting to know comedians in Oklahoma as well. 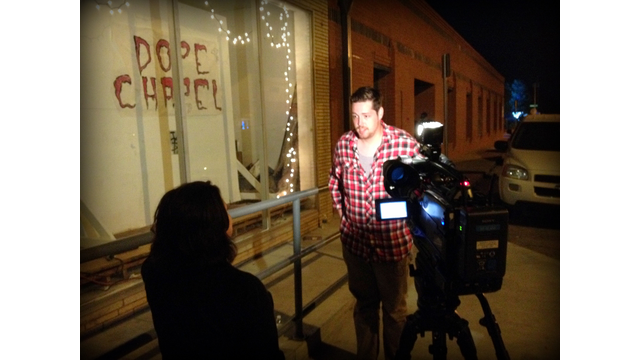 We spent Saturday night at Dope Chapel in Norman interviewing comedians and gathering video of their stand-up sets. We can’t wait for you to giggle along with us as you meet some of Oklahoma’s best jokesters. We are tickled to continue exploring all the best in local comedy to learn about the triumphs and challenges behind the comic at the mic.